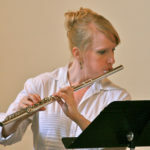 This month’s Musician’s Musings was written by substitute flutist and BSO Board Member, Charlotte Bartholomew. Does music give you chills? Having been born to two parents who were musicians, I assumed everyone in the world felt chills or had emotional responses when listening to music. Imagine my dismay in junior high when, upon doing a scientific survey of one – with my closest friend – as we swooned over songs played by the most popular band on the radio at the time, her answer to my question about whether she felt chills was, “No.” I hid my shock, having thought the question was basically rhetorical. Five years later, as a music major in college, I instinctively knew I was among fellow chill-feelers. Whether we are simply listening, or participating in making the music, apparently 50% or more of us have this type of reaction (read the article! ), and the percentage is much higher among musicians. While this sensitivity may or may not make me a better communicator, it influences my drive both to create and listen to music, not just in a vacuum, but in the rewarding and unpredictable province of Other People. As with all artistic works, there is something wholly impressionistic about music – the experience of it is different for each individual; at once, we share it with others and own it for ourselves. In an orchestra, we seem to be doing both simultaneously. During those glorious moments when we are musically and mentally in sync, I equate the chills I feel to a sympathetic vibration with everyone else in the group, and I believe that collective sensation is telegraphed to audience members. They, in turn, feel chills or whatever the music happens to evoke for them. That is when we are communicating beyond printed notes on a page.